In a departure from the academic tone of the summit, “Knowledge Keepers: Examining Indigenous Food Sovereignty”, began with a smudging ceremony. 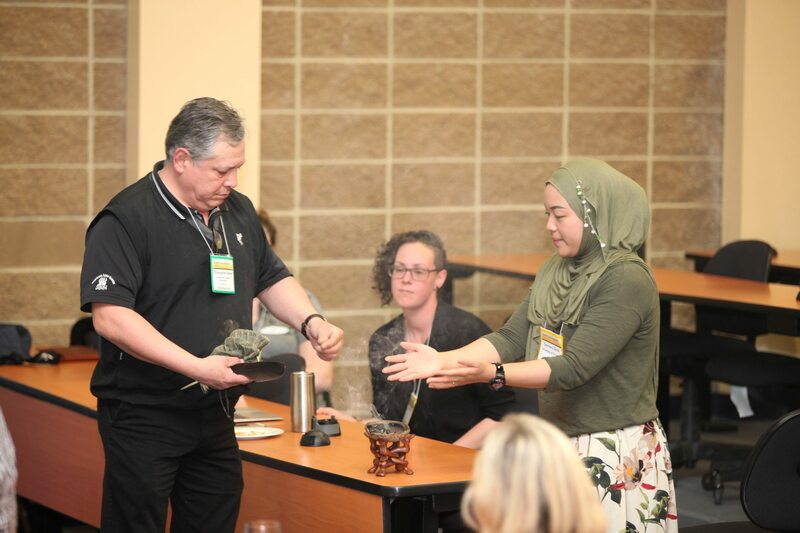 After burning smudge (a mix of 293 herbs) in a hand-carved wooden bowl, and saying a prayer to dispel negativity in the room, Chris Green of the Six Nations Farmers Association told the assembled group of academics about growing up on Six Nations of the Grand River. As a child, his classroom was the bush, where he learned how to identify plants, what to eat and what to avoid, how to tell ripe sumac from its earlier, poisonous stage. Green guided the room through various medicinal herbs (yarrow, marigold, stinging nettle, sweet flag) and their uses — Mullien for lung problems, violets for bleeding — while reinforcing his core belief that nature presents a solution for any illness. Researcher Charlotte Wolfrey brought the group into the problems of the contemporary era, describing her community of Rigolet in northern Labrador, where 59 percent of the population experiences food insecurity and life expectancy is 20 years younger than the national average. The most recent threat to Wolfrey’s Inuit community is the construction of a hydroelectric dam at Muskrat Falls (an already-trouble project with a ballooning budget projected to increase energy costs), which Wolfrey believes will contaminate seal and fish. Sharing some of the findings from his research paper “Decolonizing the table by empowering household food sovereignty”, Joseph LeBlanc, executive director of the Social Planning Council of Sudbury, focused on the failure of food security measures in Indigenous communities. Through slides illustrating the increased cost of food in northern Indigenous communities — the over-subsidization of potatoes, onions and carrots resulting in a lack of green vegetables on shelves, a 40 percent error variable in moose hunting management (“If we continue to make this level of error, we won’t have any moose”), households dependant on single-source inputs, a map of pesticide use in northern Ontario — LeBlanc argued that food insecurity amongst Indigenous communities is not a side effect of colonialism, but the function of it.